I finally got to try Fries & Dolls as they came to Deerfoot Meadows in Calgary. I’ve always wanted to try them and I finally had the opportunity to. It’s wonderful and worth the wait! The wait was around 20-25 minutes from line up to satisfying my belly. Because of their creativity, they have names for each of the types of fries and sweet potato fries they carry on their truck. The names of the sizes ranged from B Cup to D Cup which I think is a brilliant idea! On top of that, the fries are named after the dolls. We ordered Marianne and Ginger which was Sweet Potato Fries – with Cajan spice. It was sweet and spicy which was a great combination! We had it with their chipotle sauce which was really a nice sauce for dipping. 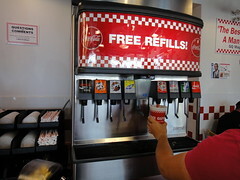 A great added bonus with Fries & Dolls, they are environmentally conscience as well, as they use biodegradable cups for their fries and forks. It’s great seeing the movement slowly kicking in gear! 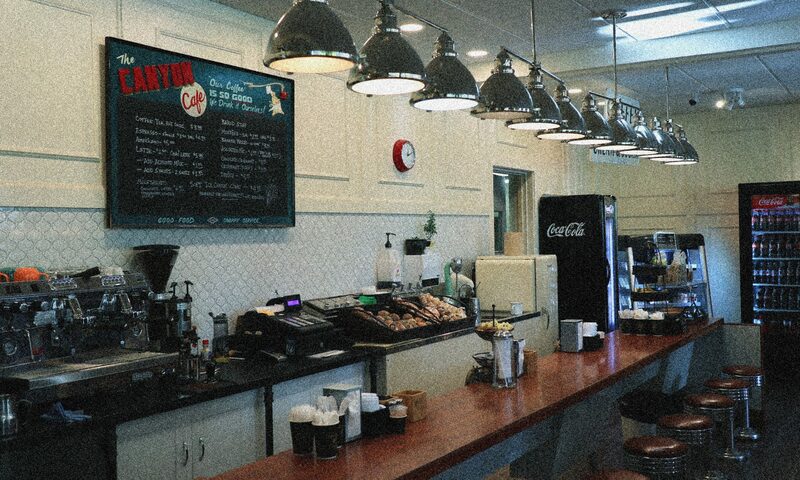 I’ve been to Cross Iron Mills a few times now, and I’ve always noticed a long line any time of day at South St. Burger Co so on this particular occasion during my visit, I craved and sat down for a burger. We ordered a Hamburger Combo to share as it was kind of a snack. Our combo, we ordered it with a poutine instead of regular fries or onion rings. 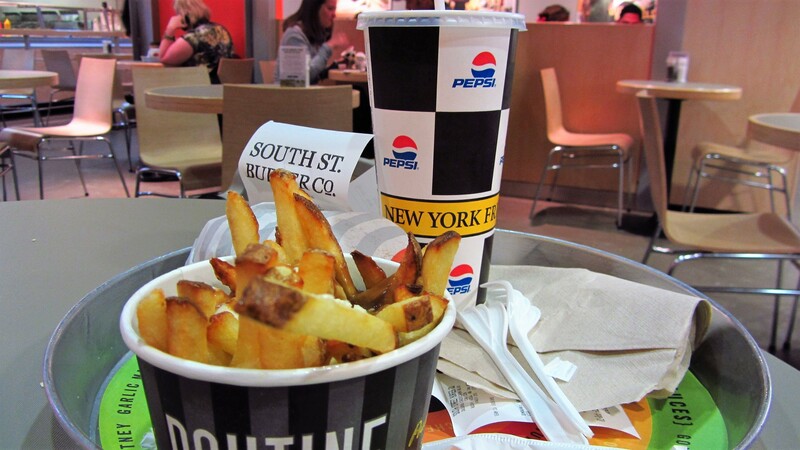 South St. Burger’s uses New York Fries for their sides, and says they are the best sides. I must say, I’ve never been a huge fan of New York fries for some reason, and this time didn’t make me change my mind either. 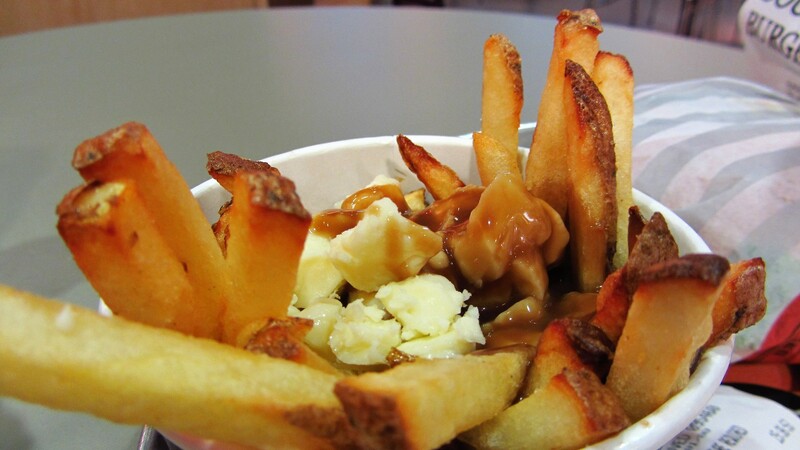 The gravy was really salty, and it didn’t taste like any other brown gravy I’ve had… and even though the fries weren’t soggy and offered a nice crisp and soft on the inside – the poutine just didn’t satisfy me. The hamburger I must say, I’m sure the beef patty was really delicious, but it was overwhelmed with all the toppings that they put on. 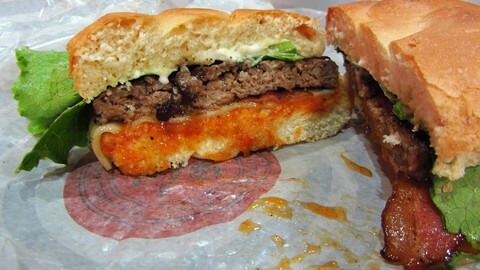 They must’ve over-dressed it, as I tasted mostly the garlic mayo and mango chutney we added to our burger. The toppings that the customer is able to choose from is extensive, with a huge array of everything! You’re able to pick your cheese, type of mustard, ketchup, mayo, relish and a sauce, plus the veggies you’d like on your burger. It is really nice you can personalize a burger, but as mentioned, I think they went a little over-board with loading on the toppings. 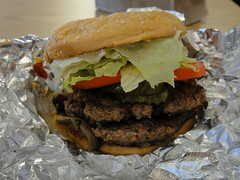 With it all said and done, it was a decent burger – not cheap, but it was good. It certainly didn’t seem like a beef burger though. So, in search of the perfect burger status – I’m still searching! 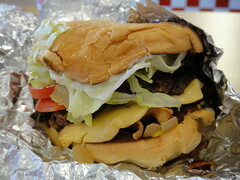 I’ve been in search of the “best burger ever” status for my records and was introduced to Five Guys Burgers and Fries and with my hopes nice and high, knowing that all their ingredients were fresh, it couldn’t go wrong! 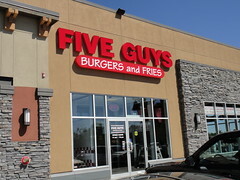 We sent in to Five Guys Burgers and quickly saw a long line up. It was on the weekends, but quite late in the afternoon. So, to my delight, I waited in line to order my burger. I ordered a Regular Hamburger thinking it was the size of a normal hamburger. When I got my burger, it was 2 patties high, and I loaded it up with their condiments. I must say, it was a delicious burger, but some how, I’ve made burgers that was even tastier. So, I was unable to crown them “best burger ever” in my books. I’m almost looking for a place that can make a burger better than mine, and till this day, I haven’t found it. I’m not saying their burgers are bad by any means. 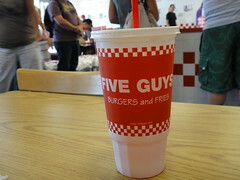 I sat there, and within 5 minutes, I gobbled down the entire burger. We also had the Regular Bacon Cheeseburger thinking more “fat” would equal “more deliciousness”. 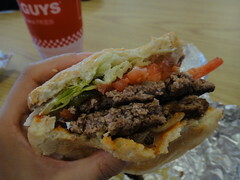 It was true, this burger truly was more delicious, but not as good as my burgers.